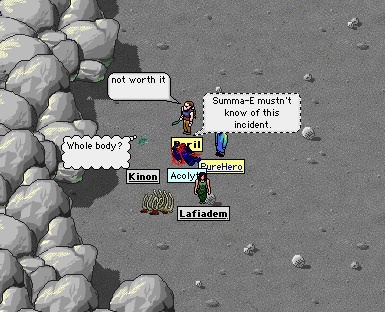 I was helping a couple of exiles who were looking for ore in the passes, and we came across a fallen Acolyte—not an unusual situation, of course. But I thought what this Acolyte had to say was interesting. I have never heard one refer to "Summa-E," nor have I seen such a person in the lands. I thought I would pass this along to your readers in case it is of interest.